Athericidae is a small family of flies known as water snipe flies or ibis flies. They used to be placed in the family Rhagionidae, but were removed by Stuckenberg in 1973. They are now known to be more closely related to Tabanidae. Species of Athericidae are found worldwide. The adults mostly feed on nectar but some species feed on mammal blood. Hematophagy has been demonstrated in adult Suragina and Suraginella and is suspected in other genera. Larvae do not feed in the first instar; after first molting they become predaceous. Larvae typically prey on invertebrates or are saprophagous. The larvae have distinctive morphology. Their head capsule is well developed dorsally, and they have long abdominal prolegs with crocheted hooks. These structures help the larvae move without being washed away in their preferred larval habitat, fast flowing montane streams and torrents. The larvae are predators of other aquatic invertebrates such as caddisflies. Adults have stout, tapered abdomens with slightly elongate legs, with aristate antennae. Males are sexually dimorphic with holoptic eyes. 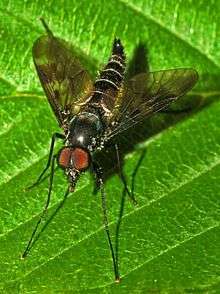 Adult Athericids usually rest on the upper surface of leaves, near the streams they emerge from or more inland if they are looking for a blood meal. It's common to see Athericids stroking/palpating the surface of leaves, something they share with Tabanidae. All species are univoltine, meaning they deposit their eggs at one time and then die. There are two subfamilies; Dasyommatinae contains only Dasyomma and all other extant genera are in Athericinae. ↑ Stubbs, A. & Drake, M. (2001). British Soldierflies and Their Allies: A Field Guide to the Larger British Brachycera. British Entomological & Natural History Society. pp. 512 pp. ISBN 1-899935-04-5.